Three subdials define a multifunctional timepiece designed with a wide face, minimalist details and a green-blue illuminated dial for low-light conditions. A sleek mesh strap completes the contemporary design and feels great on the wrist. 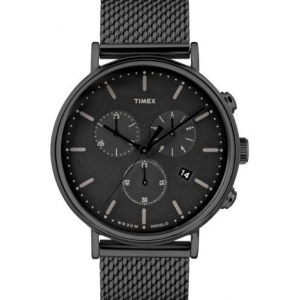 Style Name:Timex Fairfield Chronograph Mesh Strap Watch, 41Mm. Style Number: 5355655. Available in stores.